I made so many colorful faux-glass pumpkins, but I had a hard time figuring out what to do with them. I thought it would be a good opportunity to make a galaxy-style dragon holding something that wasn't holding a d20 for once (I know that the dice aren't for everyone). I've been calling this particular dragon a 'supercharged' galaxy dragon, because not only did I go with my standard blue and purple mica pigments for the nebulae, but I added some super chameleon flakes on top for extra color-shifting sparkle. It does not disappoint! Crafted from polymer clay, glass bugle beads, mica pigment, super chameleon flakes. 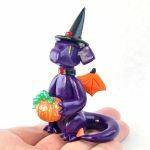 This dragon has already found a home, but you can still visit her Etsy listing to view additional photos. Just a reminder that I'll be sculpting on stream tonight from 7-10pm Pacific. As always, you are invited to stop by and say hi over on Twitch. awwww wow! great use of colours! Oh wow, she's beautiful. I love the colours in this as well as how well the pumpkins compliment the swirling galaxy motif. It's absolutely gorgeous! It's a neat dragon to me because there's a lot to appeal on with its seemingly eyeless gaze and skin for the galaxy. Oh my what a cutie patootie!